If your job deals with processes or systems of any kind, you may already by familiar with UML. The Unified Modeling Language, or UML, is a popular modeling language in the field of software engineering. It's used to analyze, plan, and execute software-based systems. A subset of UML is the sequence diagram—as the name suggests, it's a chart that describes the interaction of participants in a system, as well as the order of those interactions. Why use sequence diagrams for business? While some engineers think that sequence diagrams are reserved just for them, business analysts can derive plenty of value from this type of chart. That's because sequence diagrams clearly lay out the timeline of complex processes. Even systems that involve intricate details and dozens of participants are easily mapped out with a sequence diagram. Best of all, this UML subtype is surprisingly easy to make and read. If you're still not sure what a sequence diagram is, check out our Sequence diagram guide. When you're ready for concrete examples, take a look at the ideas below and add your own in the comments! 1. Communicate the current state of the business and its essential processes. For example, a marketing firm can model the process of webpage creation with a sequence diagram. It should show important interactions, such as typing out an idea, soliciting feedback on a first draft, and publishing the final product. Participants could include the copywriter, editor, graphic designer, and team supervisor, among others. 2. Create a requirements document to demonstrate necessary resources for a future system implementation. 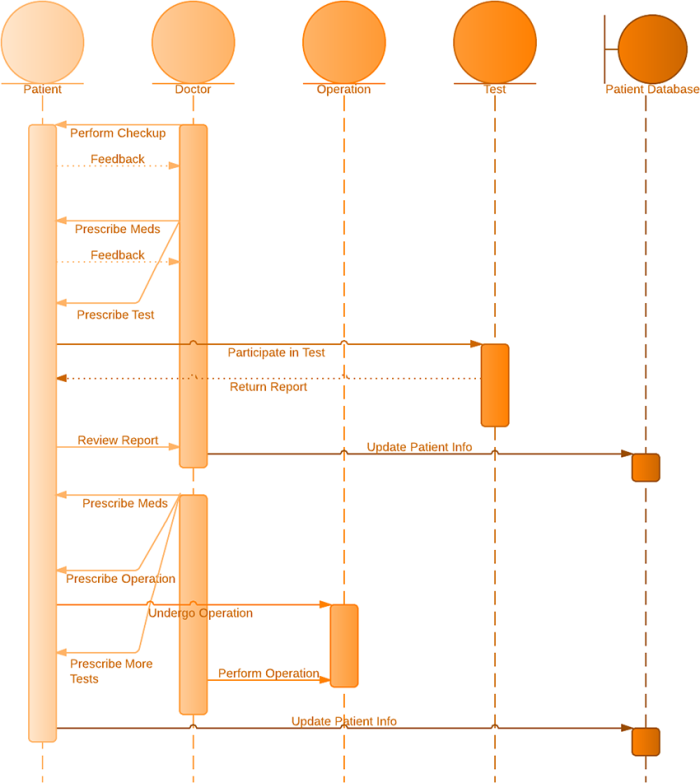 If a software company planned to release a new product that improved typing skills, a sequence diagram can plot out when and how users interact with the program. Each step, including logging in, changing account settings, beginning a typing drill, and completing a skill assessment, can be documented and handed to the development team as a reference. 3. Analyze and streamline existing processes. We know several medical professionals who use Lucidchart to improve their patients' experiences, especially in a busy clinic atmosphere. A sequence diagram like the one below can help administrators pinpoint blockages and inefficiencies in their management system. Try drawing a sequence diagram in Lucidchart when you need a refresher course on crucial aspects of your business, or when you're preparing for a transitional period in the organization. Browse our UML diagram examples for free templates to help you get started. Our free UML diagram tool comes standard with UML shapes and connectors, so you can make all types of UML diagrams for your company. Try it today!